Are your garage floors, walkway or porch areas in need of a super tough epoxy finish? Renew and protect your garage floor, concrete walkways or patios with a durable epoxy finish. Our Jacksonville customers find epoxy floor coatings and epoxy finishes hold up and protect like no other high-performance coating! Your Jacksonville floors are under constant strain, from heavy foot traffic, harmful chemicals and lets not forget harmful weather. Epoxy floor coatings are virtually impermeable, providing protection while remaining easy to clean & maintain. Beauty! And protection! Some floors require an epoxy coating due to heavy traffic or abuse. Extremely strong and resilient; epoxy floor coatings are a smart way to achieve maximum effectiveness with your high traffic floors. 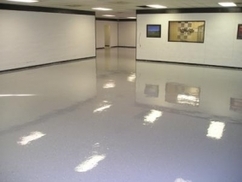 We posess extensive knowledge with epoxy floor coatings and polyurethanes for commercial and residential application; epoxy floor coatings are durable & beautifully protecting. 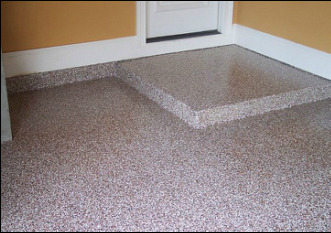 Epoxy floors are the way to go for your Jacksonville floor. Many of the garage floors we tend to were due to customers using the “do-it-yourself” kits from the big box stores such as Home Depot & Lowes, they just don't last. Our professional epoxy garage flooring system is guaranteed to last many years. Be sure to understand the difference of a professional epoxy garage flooring system, compared with cheap paint or stains that fail and peel off. It takes extreme preparation using professional equipment and high performance professional products to hold up to vehicle and foot traffic. Let's face it; you don't want a garage floor that peels up under foot or tire wear. With our epoxy garage garage floors we prepare extensively; profiling, grinding, etching, and cleaning the surface thoroughly. Applying a full coat of high performance primer, a thick and consistent base coat and lastly; application of a glossy epoxy finish coating that will protect & last for years. Done right; epoxy garage flooring is a durable, cost effective way to add beauty, character and protection to your garage floor. Your Jacksonville home or business, garage, office or showroom floors & exterior decks are sure to take a beating. You need a high-performance epoxy floor or deck coating that can stand up to the Florida climate and daily abuse. Pro Color is a professional painting company who understands deck & epoxy floor coatings inside and out. 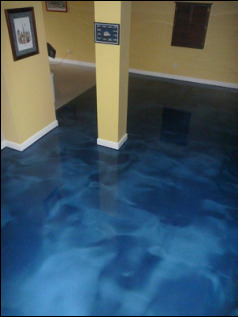 The high performance coating experts at Pro Color Jax have experience and knowledge with various types of residential & commercial epoxy floor, deck coatings and high performance epoxy finishes. Epoxy floor coatings and finishes do have their limits. Adhesion problems can occur with epoxy floors due to hydrostatic pressure, underground water pressure, moisture intrusion issues, the settling or shifting of concrete slabs, abuse or other improper condition. These conditions are rare and would affect any other type of flooring as well. An epoxy finish will hold up considerably well when compared to many other flooring options. 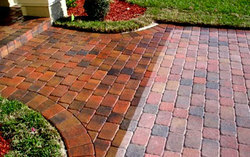 Pro Color Jax can protect and renew your concrete surfaces, Kool Deck or brick pavers with a variety of concrete sealers or finishes. From highly durable clear sealers to long lasting colorful paints. Even if your looking for concrete staining. There are many options available for your Jacksonville, FL. home or business. Call the experts at Pro Color Jax today to schedule a free evaluation for your Jacksonville property. Regardless if you hire a professional or paint epoxy floor yourself; know the proper steps and products to use.